By Lee Boland for Community Science Forum: Water Photo: North and East Branches of Running Valley Stream, demonstrating turbid water from a sand mine stormwater breach along the North Branch. The industrial sand mining industry in western Wisconsin increased dramatically with the rise of the U.S. natural gas and oil market, as sand is used as proppant in hydraulic fracturing. This “frac sand” mining includes blasting through sandstone hillsides and crushing, sorting, settling, and transferring sands off site through truck and rail. Wooded hillsides become barren, leaving scars of earth open to erosion, and mounds of sand and silt exposed, producing windblown dust and sediment-laden stormwater runoff. On September 8th, 2014 an intense rainstorm occurred near Colfax, Wisconsin; four inches fell in three hours on an area that included a frac sand mine. Within several hours the creek running through town – 6 miles downstream of the mine – was the creamy color of colloidal clay. From town, we followed the Eighteen Mile Creek discoloration 2.5 miles upstream to where it branched with Running Valley creek and finally to the southern edge of the Enron Oil & Gas (EOG) mine, taking photographs of the turbid water from public roads. One or more settling ponds in the mine had obviously been breached so that the glauconitic clay suspended in the pond water or stored in the mine’s spoil piles had been released into the streams. Since this now-idle sand mine had no onsite washing plant, its raw sand was trucked 16 miles to a washing and drying facility near a railhead where the saleable sand was loaded into railcars. Then, 30% of the raw sand comprising clay and other waste products was trucked back to the mine spoil piles, where it still contributes to the stormwater sediment runoff. Both creeks near the mine are Class II trout streams. Both ran creamy for more than two weeks. This caused a lot of concern for the health of the trout habitat there and for the general fisheries downstream in the Red Cedar River and Tainter Lake. The people who have regularly monitored the two trout streams for years for temperature, turbidity, rate of flow, macroinvertebrates, and oxygen content monitored them again soon after the spill event. They found that at the Running Valley site the stream bottom was definitely higher than before, and walking in it was like walking in billowy powder. The new material was sticky clay that covered the native sand/gravel streambed, where trout need to nestle their eggs. The Wisconsin DNR said that Running Valley Creek had been tested for Total Suspended Solids after the spill and the TSS count exceeded 1200 milligrams per liter (mg/L). The permissible level is 40 mg/L. Such turbidity seems not to have bothered the Wisconsin DNR: No citations were issued. The WDNR representative said nothing illegal had occurred. On July 6th, 2015 another large storm occurred in the same area. Again the two creeks ran cream colored. 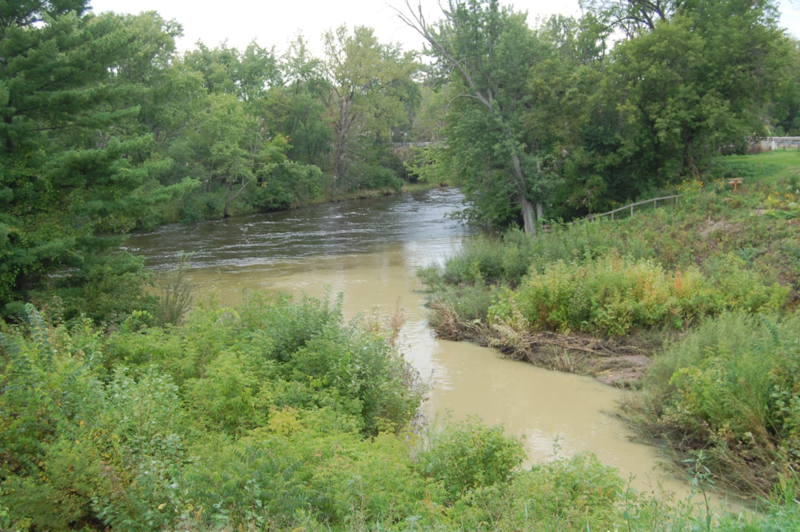 Although the North branch of Running Valley Creek was colored brown by farm field erosion, it cleared up one day later. The East branch flowing from the EOG mine remained creamy for several more days. The WDNR stormwater regulator dismissed the possibility of the mine having turbid runoff because mine personnel had given him a tour the day following the event, showing him that a settling pond overflow riser had been balloon plugged so that “no water could escape,” despite there also being several other ponds scattered around the mine property. He concluded that farm field erosion was entirely at fault, though no row-crop fields open to erosion existed anywhere along the East branch of Running Valley Creek, he had interviewed no farmers, and he had not contacted the citizen stream monitors. At least Enron Oil & Gas took the matter seriously: a huge new settling pond structure was built in 2015. It was designed for a 500 year storm event. County regulations require a 100 year rainfall design while the DNR requirement is for a laughable 10 year event. It should be noted that 100 year (+) rainfall events have happened here several times in the past five years. On September 21st, 2016 it happened yet again: 5.5 inches of rain fell in approximately two hours during the night. By noon we were visiting the place where the North and East branches of Running Valley Creek merge, taking photographs of the confluence from a nearby road (see photo). The giant new settling pond had done its job; the East branch was running clear. This time the North branch was cream colored. The northwestern corner of the mine contains a surface water pond and a number of raw sand stockpiles. While it would have required trespassing to photograph this area of the mine, aerial photos and a flyover suggested that a breach had allowed clay-laden water to escape west into the North branch of Running Valley Creek. This mine is a classic example of how problematic frac sand mining is. Even though EOG attempts to be a good operator, when 250 acres of steep terrain are totally eviscerated, it’s no surprise that bad things can and do happen with surface runoff and hydrodynamics. Stream-cooling seeps and springs disappear, and such an expanse of denuded sand strata opens a “Pandora’s box” of possible water problems. For instance, when aquitards are destroyed, percolation rates accelerate. When nature’s filtering layers are removed or processed such that they’re exposed to oxygen, acidification and leaching can occur. It would be hard to find a more porous and vulnerable strata than the nice white Wonnewoc formation which is being laid bare in a hundred sand mines. The groundwater aquifer lies right below the Wonnewoc, endangering people’s well water. And then there’s the problem of mine reclamation. The mines have been idle for a long time now. Little supervision of them is happening. Almost no reclamation has been completed. Will they ever be reclaimed and by whom? The rains won’t stop. Lee Boland is a Master’s level Civil Engineer, registered as a Professional Engineer for 52 years. He and his wife Katherine Stahl live on 360 acres of woodland across the fence from a proposed 1310 acre mine.